The team that covered Mountain Medicine 2017 included (front, from left): Naomi Thomas, Kristina Griffith, Victoria Knight, Professor Patricia Thomas, Saleen Martin, Melissa Campbell, Elspeth Male; (back, from left): Abraham Park, James Lichtenwalter and GHN Editor Andy Miller. While today’s technology has improved the ability for journalists to conduct interviews by phone or email, there are many stories that cannot be told without a one-on-one interview. 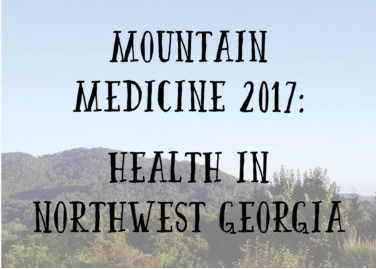 For this reason, Pat Thomas, the Knight Chair in Health and Medical Journalism, assigned her eight students to participate in the second annual rural health reporting project, venturing to northwest Georgia near Rome and Dalton, Georgia. The goal of the five-day trip was to tell stories that wouldn’t ordinarily be written because there are not enough reporters in rural Georgia areas to cover them. The series of features written by the HMJ graduate students, can be read through Georgia Health News. Flexibility is key and a valuable lesson for the students. Student Saleen Martin kept reminding herself of the question she set out to answer: “What happens when a state hospital closes?” Mental illness is a subject she has always been passionate about, and writing about what happened to the patients once the Northwest Georgia Regional Hospital closed became a personal mission. It took her in several different directions, however. Martin also said that having the opportunity to talk one-on-one with her subjects made all the difference in the world, especially for one of her subjects, Delores Nowell. Establishing the confidence and trust in a building relationship between a journalist and her subject is vital. Other features will be posted in upcoming weeks. Georgia Health News editor and CEO Andy Miller, who traveled with the group and Thomas, said the program is invaluable to his publication. The experiential learning trip was funded by a grant from the Healthcare Georgia Foundation and the Institute of International Education, with travel support made possible by the Ford Foundation.